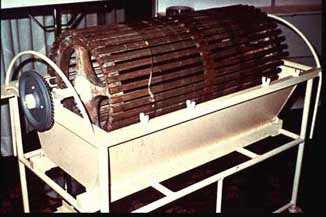 When discussing the history of dialysis, any renal fellow worth his weight in urine will know that the inventor of the first practical dialysis machine (the "rotating drum" machine shown at left, which consisted of 30-40 meters of cellophane tubing within a stationary 100-liter tank), was Dutchman Willem Kolff, in 1943. Less well known is who came up with the term "dialysis" in the first place. It was Thomas Graham (right), a Professor of Chemistry in Glasgow, Scotland, who ascertained that crystalloids were able to diffuse through vegetable parchment coated with albumin, which acted as a semi-permeable membrane. He coined the term "dialysis" to describe this phenomenon in 1861, and using this method was able to extract urea from urine. A very interesting website describing some of the milestones in nephrology history can be found here.